Alright, you heavy metal detectives, let's see if you can deduce anything about Canada's Axxion from the clues. Carefully cut concert tees bearing the names of Grim Reaper, Saxon, and Cauldron. Bullet belts. Black leather biker jacket with denim vest over top. Chick in tight leather pants and heels. Goofy 'metal' pseudonyms for some band members. Homemade band logo. 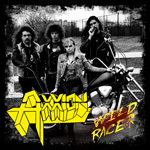 First release, Wild Racer, on both CD and vinyl. Yeah, you guessed it: Axxion, pronounced 'action,' plays classic early Eighties heavy metal, with a dose of speed metal to liven things up. The band offers bands such as Grim Reaper, Dokken, Tyran Pace, Riot, and W.A.S.P as influences, but also Canadian metal heroes Reckless, Sword, Helix, early Anvil, and Thor. The album includes a cover of the latter's Ride of the Chariots. Essentially then, Wild Racer is rather straight forward traditional heavy metal. Most songs have a galloping pace with Dirty D Kerr's high pitched, nearly falsetto, vocals floating over top, and Sir Shred's guitar filling them with generous solos. While Axxion gets the genre, after listening to the first several songs, you know what the rest of the album will sound like. The possible exception could be Still Hungry which sounds more like Eighties melodic hard rock. Production suffers a bit, being somewhere between flat and muted. I'd like to think this comes from a pure analog recording process or some decision to mimic early Eighties tape trading mix against modern auto tuning, but I'm not sure. Playing it loud really makes no difference. Otherwise, for classic metal in the modern context, Axxion is straight on target, with lots of promise for future accomplishments. Recommended to 'true metal' fans everywhere. Axxion offers your ears a generous platter of traditional Eighties heavy metal with a touch of speed metal to keep things lively.